These soft and cakey Pumpkin Chocolate Chip Cookies are flavored with pumpkin puree and pumpkin pie spices, and studded with chocolate chips! If you’ve got leftover pumpkin puree that needs to be used up, this is a fun sweet treat to make with it. When fall rolls around, I stock up on sugar pumpkins and make my own fresh pumpkin puree. In additions to soups and savory dishes, I love making fresh Pumpkin Pie, Pumpkin Muffins, a good old-fashioned Pumpkin Roll, and so much more. I go kind of crazy, hah! Since pumpkin puree does not freeze well, I try to find places to put it without wasting, and these cookies are one of my favorite excuses. I often like to call these cookies “pumpkin clouds” because they are so light in texture. The texture is almost like a whoopee pie! Because the texture is cakey and muffin-like, the chocolate chips add a welcome contrast to the texture, and I find the chocolate flavor goes really well with the pumpkin. Note that fresh pumpkin is normally much lighter in color as compared to the canned stuff, so that’s why it looks so light! The cookie dough is now ready to be baked…with maybe a few spoonfuls enjoyed here and there, haha! 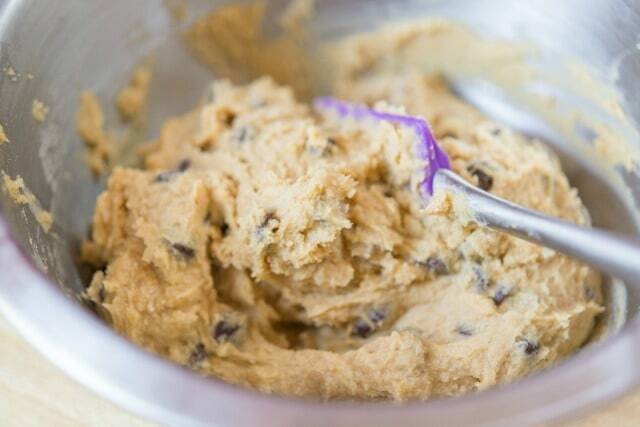 It’s a pretty delicious cookie dough. The full recipe and a step-by-step video are below if you’d like more guidance. Enjoy! Can you freeze Pumpkin Chocolate Chip Cookies? Yes, store in an airtight container for up to 2 months. Can you freeze the dough too? Yes, but I’d recommend portioning it out into individual scoops first, so you don’t have to thaw the entire batch of dough before baking. Add a few minutes of bake time if baking straight from frozen. 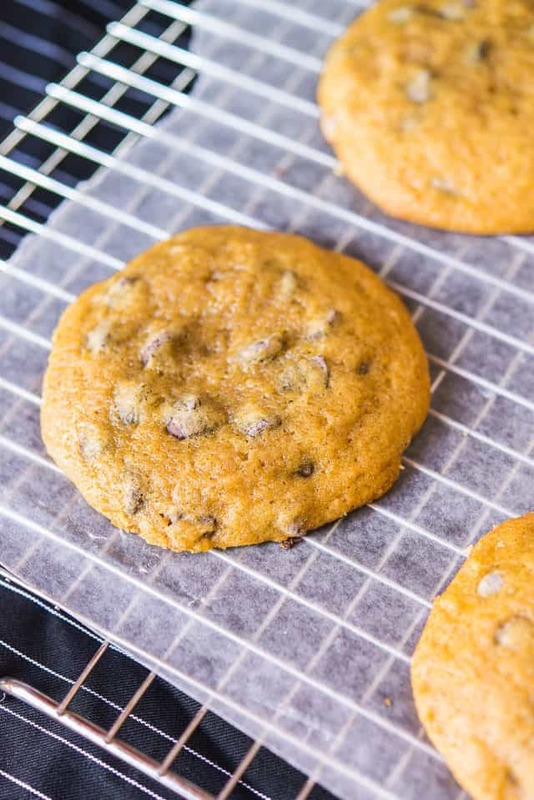 Preheat the oven to 350 degrees F. , and line a cookie sheet with parchment paper. 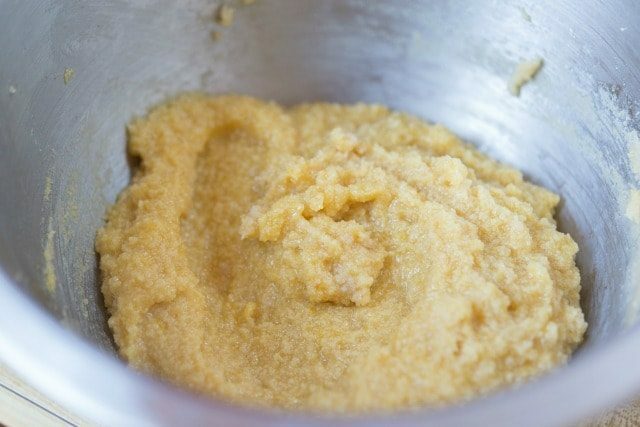 Using a handheld or stand mixer, cream together the butter and both sugars for about 60 seconds, until combined. Beat in the egg, and once that has been incorporated, beat in the vanilla and pumpkin puree until combined. In a separate bowl, whisk together the flour, baking soda, salt, cinnamon, ginger, nutmeg, and cloves to combine. 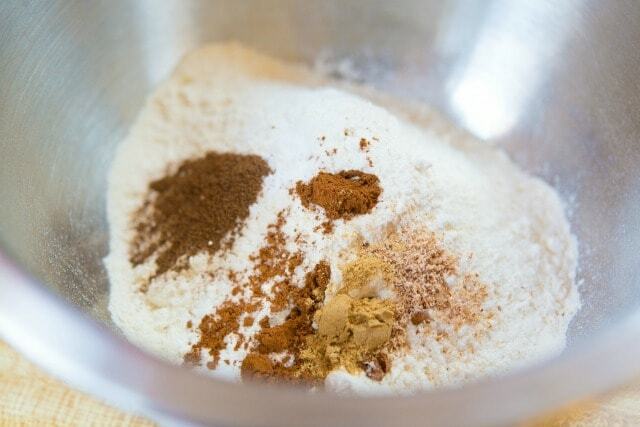 Add this spiced flour mixture to the wet ingredients, and mix until all of the flour streaks are almost gone. Mix in the chocolate chips. At this point there should be no more flour streaks, but take care not to overmix the cookie dough. 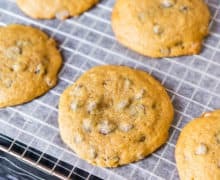 Use a large cookie scoop to portion little heaps of cookie dough onto your baking sheet (I had 12). 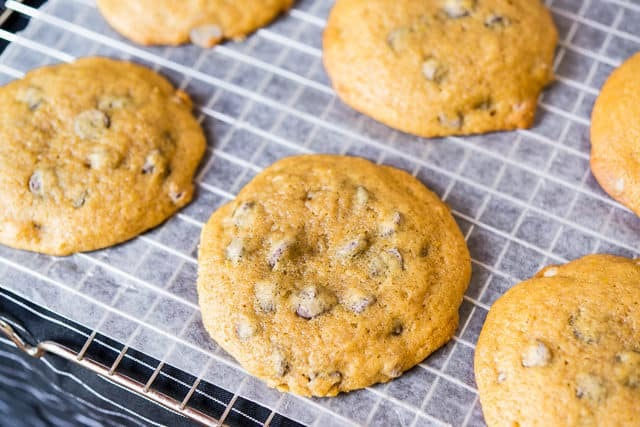 Bake for 15 minutes, until the cookie dough is no longer raw, then let cool on a wire rack. Enjoy! Recipe adapted from George Duran. Post updated September 2018. Originally published October 2013. This post contains an affiliate link. Somehow, when I baked these, they came out like little muffin tops, rather than cookies, like shown in the picture. I thought I followed the recipe exactly. Perhaps the butter was not soft enough? The taste came out great, very cakey, but almost like a muffin! Did I miss something? Hi Danielle, that’s so wonderful! Though I admit this pumpkin chiffon pie you speak of sounds pretty delicious too. Hope you enjoy another batch of these cookies! I made these exactly as the recipe stated and they were excellent. I have made these cookies for years and this is the recipe that I will use now. Thank you!